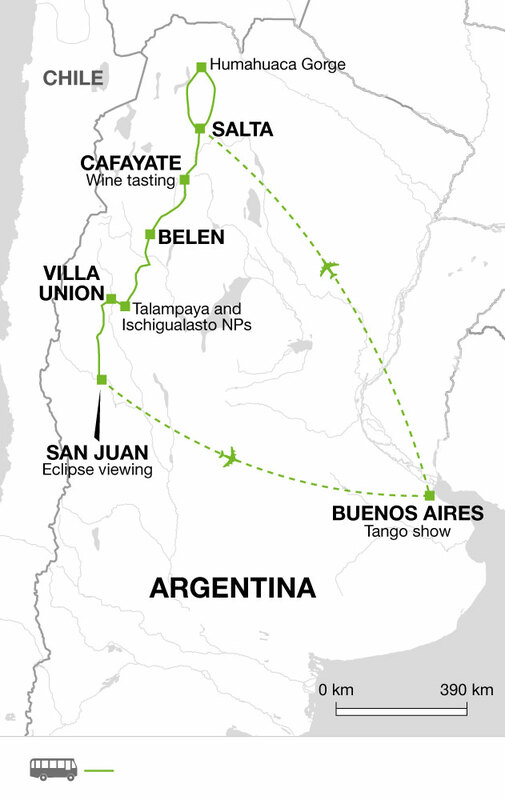 Combining the unique spectacle of the total eclipse with some of the most breath-taking landscapes in South America, this two week adventure takes you from the inspiring, diverse city of Buenos Aires to the brightly coloured mountains, deep gorges and fertile plains of Argentina's northwest region. Woven into this exceptional landscape is a strong cultural and gastronomic presence; we discover the indigenous heritage still found in the Andean region, manifested in the art, weavings and lifestyle of the locals, and taste Argentinian wines in one of Cafayate's many vineyards. Today we will take a tour of the city, exploring the major landmarks around the Plaza de Mayo, site of the famous mass demonstrations by supporters of Juan Domingo Peron in 1945, organised by his wife Eva. We'll also visit the elaborate mausoleums of the famous Recoleta Cemetery, the final resting place of some of Argentina's most revered figures, including Eva Peron herself. Our tour will also take us via Palermo Park and the tango-filled streets of La Caminito in the La Boca district of the city. Settled originally by Italian migrants, the area is famed for its colourful houses and lively street performers. This morning we board our flight to Salta, the colonial city that is the hub of Argentina's northwest. Salta's grand neo-Classical buildings and bustling town squares are perfect for exploring on foot. In the heart of the city we discover the extraordinary pink cathedral and the San Francisco Church. We get a great view of the city and surrounding valleys from San Bernardo Hill, a slog of more than 1000 steps, with the 14 stations of the cross built into the side of the hill. Fear not, as we plan to take the cable car up to the top, where we will find an amphitheatre and coffee shop, and we may see some of the locals looking for a shady spot to prepare mate - a bitter green tea drink that takes centre stage in most Argentinian social gatherings. On descending the hill, we may have the chance to sample a staple of northern Argentinian food; empanadas in Argentina are much like the pasties of Cornwall, but much smaller, lighter, and in a wider variety of flavours - all deliciously addictive! Today we set out to explore the UNESCO Heritage area of the Humahuaca Gorge, a highlight of any trip to the northwest of Argentina. Purmamarca is one of the towns within the gorge, and setting off today we can appreciate the town's incredible backdrop - a mountainside named the 'Seven-Coloured Hill' for its bright shades of yellow, oranges, reds and green. Indeed, the rest of the day's journey is awash with colour and scenic roadside lookouts; another appropriately named mountain is The 'Painters Palette'. Through our exploration today we visit the regions old traditional villages, such as Tilcara, Maimara and Humahuaca - these villages are perfect people-watching opportunities, and it's interesting to see the heritage from the pre-Columbian period which gives this area of northwest Argentina a very distinct sense of cultural identity. This is not only manifested in the woven items that are particular to the Andes, but also in the local diet, with northern food including llama stews and corn dishes. We return to Salta this evening and can make the most of our journey in the north by eating at one of the local restaurants. Today we take route 68, which connects Salta to the small town of Cafayate and its surrounding winelands. The views down this road are spectacular, particularly in the Quebrada de las Conchas, or 'Shell Gorge', with its bright orange jagged rock formations standing out against the greens of the sparse trees and bushes that line its walls. There are some impressive geological formations on show here, all shaped by the winds that have blown through the gorge. After making several stops on our way, we arrive into Cafayate in the afternoon, ready for a round of wine tasting in one of the area's rustic wineries, their rows of vines backed by the stunning mountains beyond. Torrontes is the wine of choice here - a white wine that is well-known for being produced in this region. Today we leave the winelands around Cafayate for the sleepy town of Belen, stopping at the ancient ruins of the pre-hispanic Quilmes civilisation en route. The Quilmes people, dating back to around AD1000, resisted the Incan invasion and lived through over a century of Spanish colonisation before succumbing to disease and war. The large site is made up of the remains of terraces rising up the cacti-covered hillside - we can walk to the top for excellent views of the valley and the site. Although not as impressive as other archaeological sites in the Andes, it helps us to understand the indigenous heritage in this part of Argentina. Woven cloth, for example, is found in many Andean societies, and on arrival into Belen we may have time to spend admiring the hats, sweaters and ponchos woven from llama and vicuna wool by the local traders, many of whom are maintaining pre-Hispanic methods of weaving. Today we enjoy a full free day in Buenos Aires to explore more of one of South America's most captivating cities. There is much to enjoy just from wandering around the districts like La Boca and San Telmo, and you could also taste some of Argentina's most mouth-watering traditional food at one of the city's many parrillas (grills). Choripan comes highly recommended - a large chorizo in a homemade crusty bread roll, covered with spicy chimichurri sauce. Delicious! Alternatively, you can escape the city with a trip to a working estancia (ranch) or take a boat trip on the Tigre delta, a fascinating insight into the manmade communities and stilted homes set around this swampy river. Please note that if you have visited Iraq, Syria, Iran or Sudan since 2011 you cannot travel with an ESTA and instead you will need to apply for a visa from the nearest US Embassy or Consulate.. If you are unable to provide a valid visa before boarding flights to the US, or entering via another method, you may not be permitted to travel.